Not all brands are available at all stores. Best Choice® offers customers the best quality for the best price, and items are equal to or better than the national brand quality. 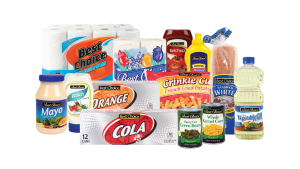 The Best Choice® brand products are priced lower than the leading national brands because they don’t carry the advertising and promotional costs that the national brands have. We promise to always deliver top quality products on a reliable basis. All Best Choice® products have a 100% customer satisfaction guarantee. Our goal is to offer your family quality products at affordable prices. If you’re not fully satisfied with a Best Choice® product, you can return it to the store for a full refund, no questions asked. We’re confident you’ll think that our brands are as good as or better than the national brands. Our goal is to offer you and your family products at affordable prices. If you’re not fully satisfied with an Always Save product, you can return it to the store for a full refund, no questions asked.